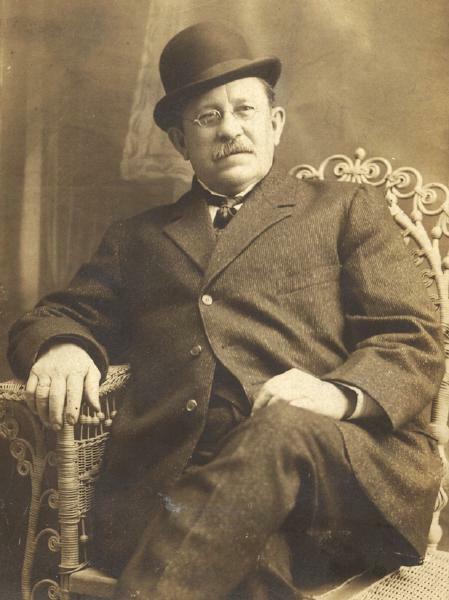 George H. Hoffman was born circa October 1854 in New York. Frederick Hoffman and Louisa Wagner appeared in the US federal census of 1 June 1860 in New York City, New York, at 2nd Division, Ward 17. Other members of the household included George H. Hoffman, Daniel Hoffman and Joseph Hoffman. Frederick Hoffman and Louisa Wagner, appeared in the US federal census of 1 June 1870 in Sandusky, Erie County, Ohio. Other members of the household included George H. Hoffman, Daniel Hoffman, Joseph Hoffman, Jacob Hoffman, Philip G. Hoffman, Wilhelmina M. Hoffman and Caroline Hoffman. He was employed in a "handle factory," according to the 1870 census. He married Louisa Lehnert, daughter of Fred Lehnert and unknown (? ), circa 1875. He was a loborer, according to the 1880 census. He was a carpenter, according to the 1900 census. He was a house carpenter, according to the 1910 census. George H. Hoffman became a widower at the 15 June 1913 death of his wife Louisa Lehnert. He was a carpenter, according to the 1920 census. George H. Hoffman died on 19 November 1928 in Buffalo, Erie County, New York. The following appeared on 21 November 1928 in the Buffalo Evening News: [Died] In Buffalo, Nov. 19, 1928. George H. Hoffman, husband of the late Louise (nee Lehner), father of Peter, Mrs. William H. Kessel, Christian, Mrs. Arthur O. Oehler, Mrs. Howard Brewer of Lockport, N. Y., and the late George Hoffman. Funeral from the family residence, 785 Glenwood avenue, Thursday afternoon at 2:30 o'clock. Friends are invited to attend. Interment in Forest Lawn cemetery. Sandusky, Ohio, papers please copy. The following appeared on 21 November 1928 in The Sandusky Star-Journal: George Hoffman, Buffalo, N. Y., a former Sanduskian, passed away at Buffalo early this week, relatives here have been informed. Hoffman was a crepenter here for many years, leaving about 40 years ago. He was 74 years of age at the time of his death. Jacob Hoffman, Mr. and Mrs. Fred Hoffman, Campbell-st, Thomas Millar and Kenneth Millar, left Sandusky Tuesday for Buffalo to attend the funeral which will be Thursday. Hoffman is survived here by a brother, Jacob and a sister Mrs. Frank Mahon, several other relatives and a great number of friends.